Corrosion can be a serious issue. Not only can it affect operating costs, it can also be a hazard to personnel. We all understand that piping ravaged by corrosion must in many cases be repaired or replaced, by what we sometimes forget is the dangers. What if that pipe were under pressure? To put corrosion control methods into action, it helps to understand what the factors are that cause it in the first place. Corrosion is the gradual disintegration of an engineered material into its constituent atoms due to chemical reactions with its surroundings. Corrosion is primarily associated with the electrochemical oxidation of metals in reaction with an oxidant such as oxygen. Formation of an oxide of iron due to oxidation of the iron atoms in solid solution is a well-known example of electrochemical corrosion, commonly known as rusting. Corrosion can also occur in materials other than metals, such as ceramics or polymers, although in this context the term degradation is more commonly used. There are a lot of factors that can affect corrosion. These factors determine whether corrosion will take place and the rate that the corrosion will progress. Environment – The general environment can be a factor. Whether there are chemicals in the environment, natural or man-made, may affect corrosion. Stress – Residual stress from fabrication can be a factor affecting corrosion as can static, variable and alternating operating stresses. Shape – The shape of the piping and other components may have an effect on corrosion as well. Joints, flanges and crevices may serve as a deposit area for trapped liquid. Compatibility – The compatibility of metals with metals and other materials will affect the corrosion rate. 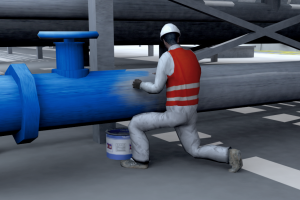 Movement – The movement of the fluid through the piping can be a factor as well. Corrosion will tend to occur more in pipes with little flow. Temperature – Temperature will affect the rate of oxidation, scales and tarnishes. The higher the temperature the higher the heat-transfer effects as well. Corrosion control is a means by which corrosion to ferrous (metals containing iron) and some non-ferrous materials is controlled or prevented. Here at TTS, our expert Process Improvement Specialists can help your organization implement customized corrosion control practices in conjunction with an overall preventive maintenance program. Cathodic Protection - Cathodic protection is an electrical means of corrosion control. Cathodic protection can be applied using sacrificial anodes or by means of a more complicated impressed current system. Chemical Treatment- Corrosion inhibitors can be added as chemicals to control and reduce corrosive environments. An example of a corrosion inhibitor is the automobile antifreeze added to a radiator to prevent corrosion in the engine block. Coatings- Protective coatings are the most commonly used method of corrosion control. Protective coatings can be metallic in nature such as galvanizing or plating. Paint is a protective coating that dries to create a corrosion resistant barrier. Design Allowance- Engineering designs sometime allow for corrosion given a known state of service. Design allowance usually applies to pipelines, vessels, or equipment where the life cycle is predetermined. Examples of design allowance would be wall thickness of pipe or metallurgy selection for a vessel. Once the design safety factor, or threshold, has been breached, replacement and/or repair usually becomes necessary.